Pentagon Centre, the big-box mall that counts Best Buy and Costco as tenants, could be transformed into an apartment, office and retail complex over the next half-century. Developer Kimco Realty owns the property, which sets between S. Hayes and Fern Streets and 12th and 15th Streets S. Kimco has applied to redevelop it into six buildings in three phases. 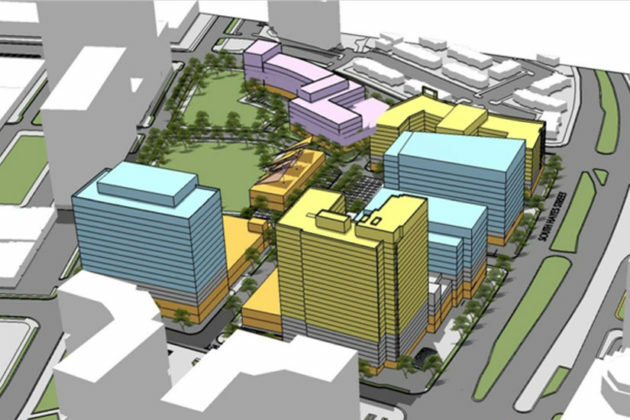 The site, which covers 16.8 acres, was approved for redevelopment in 2008, also with a three-phase plan. Since that plan’s approval, the recession hit and Arlington’s office market has stagnated. Now, Kimco is requesting to build residential buildings first and office last, but is also asking to build more residential and less commercial than previously approved. First, if approved, Kimco would replace the Sleepy’s store and the loading dock at the corner of S. Hayes and 12th Streets with a 25-story residential tower that would be the tallest building in Pentagon City. The tower would be built adjacent to the Pentagon City Metro station entrance. 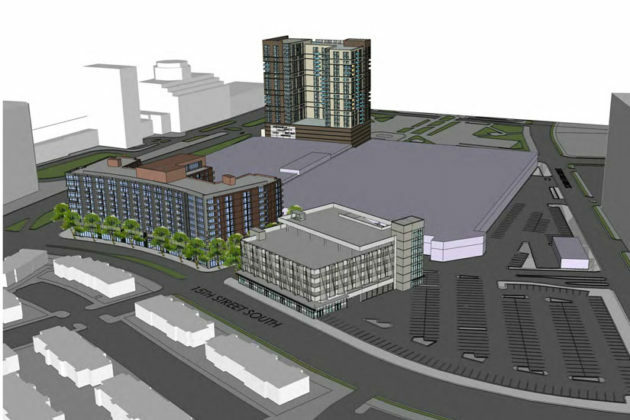 Also in Phase I, Kimco plans to build a 10-story residential building at 15th Street S. and Hayes Street, with a seven-story parking garage along 15th Street to replace lost parking spots for Costco. 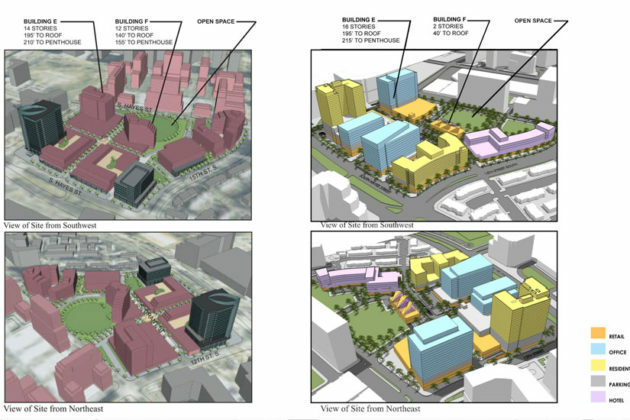 The two apartment buildings would bring a combined 714 units to the area. 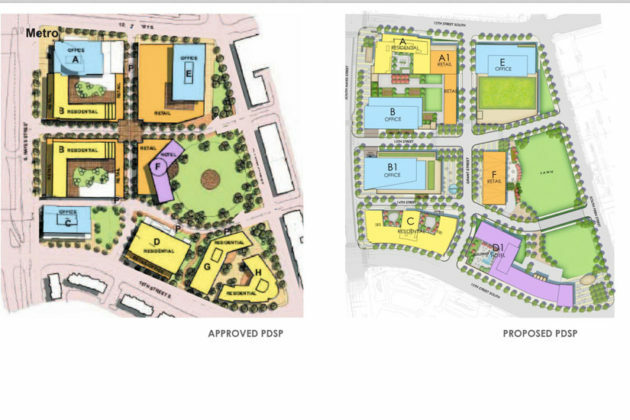 The office, hotel and open space components of the plan, if approved, wouldn’t come until decades later. 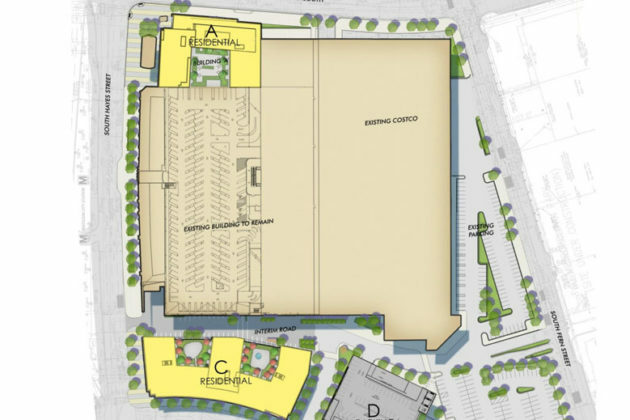 If that construction begins as planned, the mall that holds the Best Buy and Nordstrom Rack would be demolished in about 20 years, during Phase II. 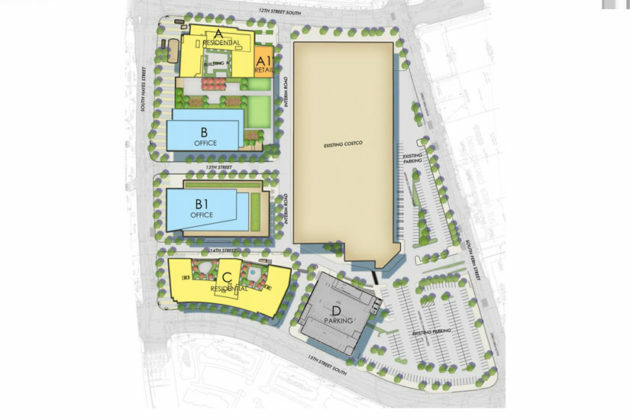 Twenty or so years after that, during Phase III, the Costco would be demolished, replaced, along with its parking lot, by a hotel, office building and open space. In addition to the 1.8 million square feet of buildings, three acres of open space would be added surrounding a new 13th Street S., along Fern Street. The developer would construct other new roads — including portions of S. Grant Street and 14th Street S. — during Phase III, where the Costco now stands. 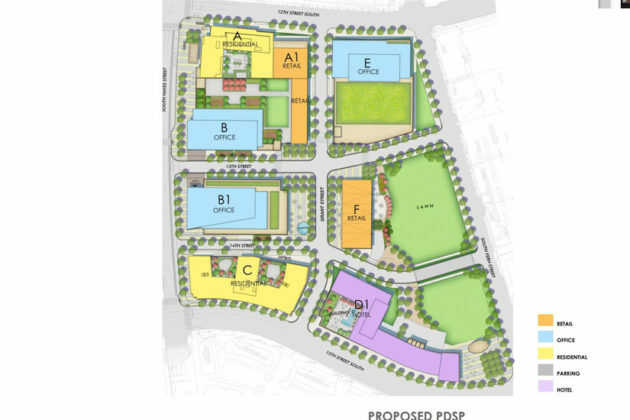 Recently approved within steps of Pentagon Centre have been the Pentagon City Mall expansion, the massive PenPlace development, the final phases of the Metropolitan Park apartment complex and a 415-unit apartment building at 400 Army Navy Drive. 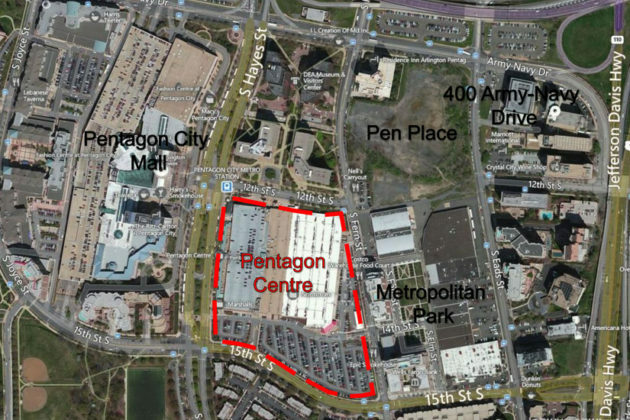 If approved, the Pentagon Centre redevelopment would remove the last big-box store in the area, further cementing Pentagon City’s status as a high-rise, mixed use neighborhood. The plan was discussed by the county’s Long Range Planning Commission in December and by the Site Plan Review Committee last month. The SPRC will meet again to discuss the proposal at the Aurora Hills Community Center (735 18th Street S.) on March 16.